You guys know how much I love Calypso St. Barth, as evidenced in posts here, here and here (just to name a few). Calypso is my go-to destination for cozy basics like striped tops, cashmere sweaters, and pretty tunics that work as a top or a coverup. Calypso pieces are perfect for this transitional weather we’ve been having in Dallas (cool in the mornings, warm later in the day). As a way to celebrate spring and get you wardrobe-ready for warmer weather, Calypso is offering an awesome gift card promo from now until March 23rd! It’s my favorite kind of sale – i.e. the more you spend, the more you save. Enjoy $50 off a purchase of $300 or more, $150 off a purchase of $600 or more, and a whopping $300 off a purchase of $1,000 or more. Kind of fabulous, no? This colorful striped bikini, this embroidered gauzy tunic and this classic striped tee are all in my shopping cart. I’m currently on the fence about this hat too. What’s in your cart? Shop more of my favorites by clicking on the items below, and be sure to enter code GCSPRING2014FB at checkout to receive your discount! I want every single pieces on the models, they are so adorable and so perfect for South Florida. I featured some pieces from Calypso on my blog today! That striped bikini is calling my name! I love Calypso! I used to work as an assistant buyer for them so I have quite the collection in my closet! That raffia hat is perfect for a beach vacay! Practical and chic. I am in LOVE with that oversized peasant shirt and shorts look… SO comfy for warm days. Dreaming of warm weather.. I feel it coming so soon! I love that look with the striped tee with the cut-offs and tennies! So cute! These pieces make me want to be on a fabulous beach vacation stat! That maxi dress is absolutely to die for. That striped bikini is calling to meeee! 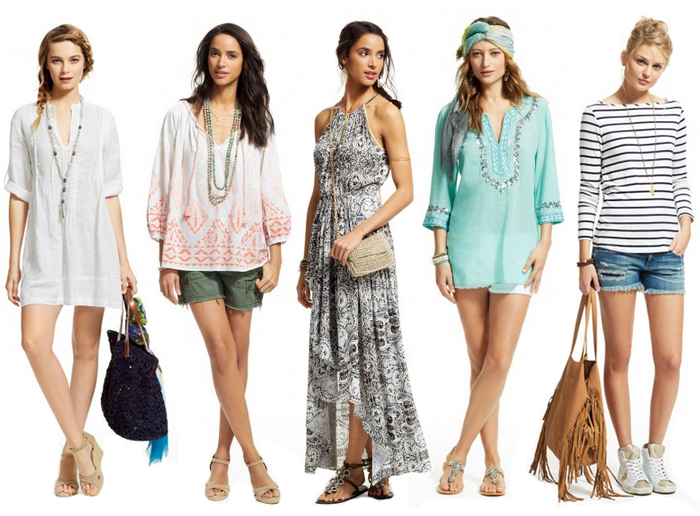 These ensembles are perfect for a beach vacation. Love Calypso and a great sale!